A writer and English and creative writing teacher plumbs her father’s past for the story of his first wife and discovers the tragic muse for one of America's greatest playwrights. At the age of 16, McCabe (What the Neighbors Know, 2014, etc.) learned a long-held family secret about her recently deceased father: well before she was born, he had a troubled first marriage to a woman who had long since died. Years later, she learned that both her father and his first wife were also literary characters in an obscure Tennessee Williams play—and that both had known the playwright well. In this debut memoir, McCabe pieces together the hidden story of her father’s life, the mysterious woman in it, and the impact she had on both her father and Williams. The picture that emerges has all the elements of a Williams drama, where life can be squandered on an imaginary fortune, blighted dreams, unconsummated desires, and the deadly solace of drug addiction. For the homosexual Williams, Hazel—the woman who would marry McCabe's father, Terence—was the woman he could neither have nor forget. “I never loved anyone as I loved her,” he later wrote. For Terence, Hazel was a doe-eyed beauty and a source of emotional anguish. 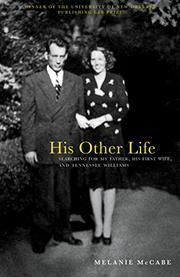 For McCabe, the marriage offers insight into the man her father was and who he became. “He made certain that my sister and I did not glimpse any of his failures or weaknesses,” she writes. “He steered us swiftly away from his ‘dark places.’ ” Along the way, the book also becomes a tale of its author’s own self-discovery, as she weighs her father’s life and relationships against her own. Finding clues sends her down a rabbit hole of biographies, old pictures, ancestral records, letters, unpublished novels, court documents, and desperate cross-country searches for living descendants; each new piece is another layer to an increasingly complex puzzle. A compelling personal and literary detective story.